Signature art or celebrity worship? I've never quite understood the fascination behind collecting autographs. 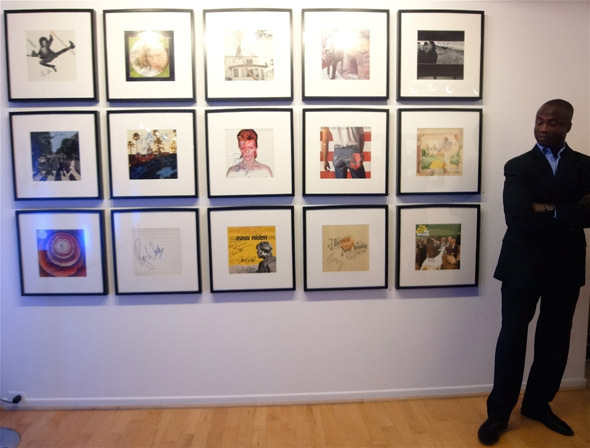 Bryan Ulrich unveiled his collection of autographed photos, guitars and memorabilia at Gallery One in Yorkville on Tuesday night, for the show SIGNED, SEALED, DELIVERED. I went in hoping to get an illuminating look at one person's celebrity obsession. While that did sort of happen, I also got a glance into an egotistical exercise played out over two decades. The show features Ulrich's private collection of authentic "signature art" and collectibles from Hollywood's biggest names including instruments signed by Michael Jackson, Jimmy Page and Led Zeppelin, an extensive collection of album covers, paraphernalia and photographs autographed by Hollywood's A-list, as well as one-of-a-kind illustrations by Matt Groening, Tim Burton, Bono and Johnny Depp. 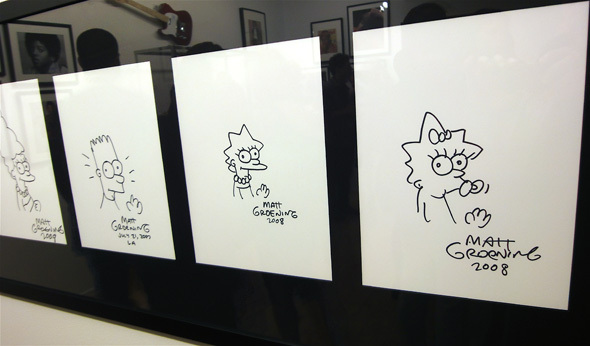 The Groening illustrations were kinda cool. 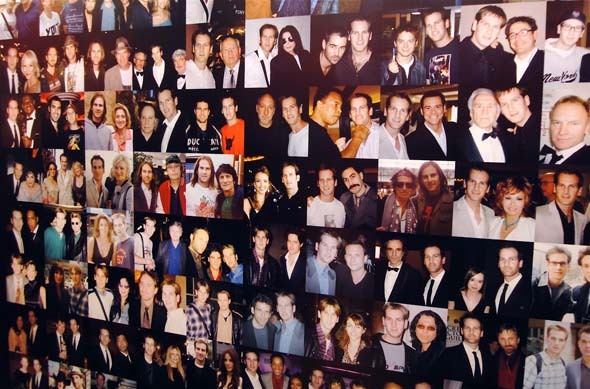 But then there was a wall of promo hand-out photos autographed by the celebs that didn't even credit the photographers, who likely weren't going to see a penny of the proceeds of this "signature art." Ulrich's life's work is the result of spending years in Los Angeles chasing down actors, musicians and other celebrities and posing with them in unflattering photos. 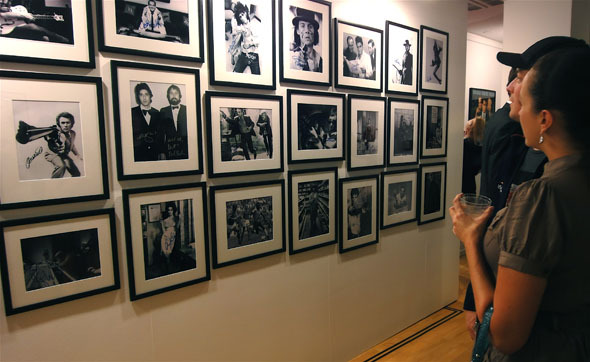 On one gallery wall was a collage of dozens of snapshots of Ulrich standing next to some celebrity. Two photos of him -- one with Marilyn Manson and one with Cher -- appeared to have been taken on the same day. After perusing the wares on the walls of the gallery I overheard a woman going on about how faked most of the photos were, and how they're doctored in Photoshop. Some looked kind of suspect, but then why would someone go to such lengths to prove he met these celebs? 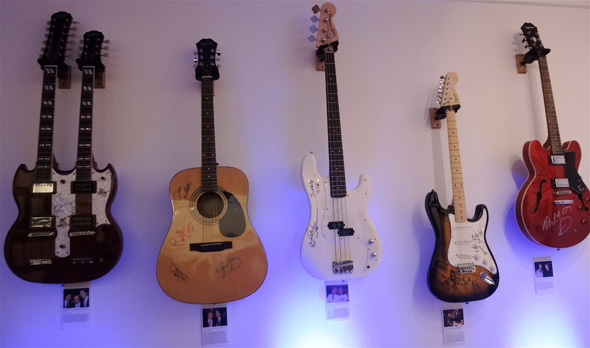 The naysayer's companion, a guitarist, wasn't too impressed with the collection of autographed guitars. "They're all Epiphone guitars," he said. "Which none of those rock stars would ever play themselves. They're basically student guitars." I later witnessed her confront Canadian-born Ulrich about the authentication of what he was presenting and he got all defensive and turned on his heels to sic security on her. So an autograph hound decided to get a cheap guitar autographed by his heroes. Big deal. Who cares if it's not an authentic Rickenbacker or Fender Stratocaster? It's not going up for auction or on the walls of a Hard Rock Cafe, right? Asking $30,000 for an autographed Michael Jackson "Beat It" jacket? That's a little steep and/or exploitative, isn't it? The collection is labeled "celebrity signature art." My biggest beef is that, while it's an impressive collection -- if you're impressed with that sort of stuff -- it's far from what I'd consider art. Perhaps he'd be better off stocking an eBay store than adorning a gallery's walls with this stuff. The exhibition is open to the public from 11 a.m. to 5 p.m. at Gallery One (121 Scollard St.) and continues until September 30. Photos by Roger Cullman Photography.